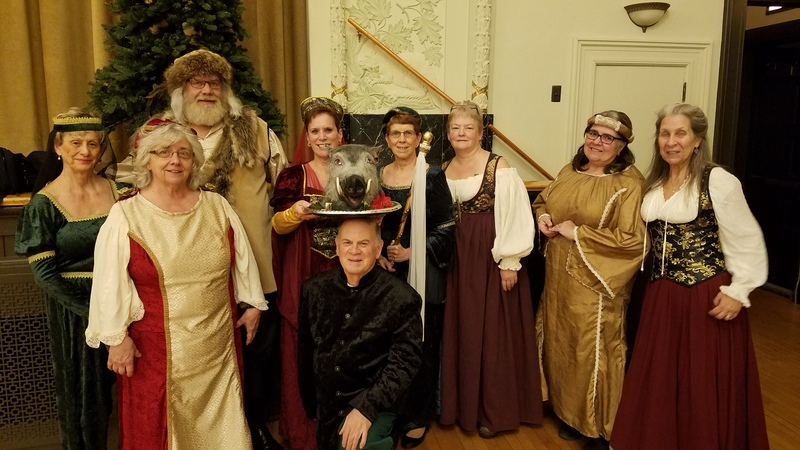 SOUTHBRIDGE – Saint John Paull II Choir’s Medieval Christmasse Feaste will open for its second year the weekend of Friday, Dec. 7, with three evening performances. During the event, the choral group puts on a four-course meal reminiscent of the Middle Ages while madrigal singers in period costume entertain guests with toasts, a walk through the dining room and various Christmas traditions. Brandon Vennink, who is the director of music ministry with Saint John Paul II Parish, found that his music background and his experience with madrigal dinners was a launching point to discussions with other parish members who were interested in creating a madrigal performance event locally during the holidays. Although several groups had done similar events locally during previous years, at the time there were no events in Southern Worcester County which provided this type of experience. So, in 2017 the group led by Vennink launched the first of what they hope will be years of a festive holiday tradition. The medieval feast and madrigal singing performance are intertwined to provide an experience that is as enjoyable as it is historic. “Like a Renaissance Fair, the madrigal group is a medieval concept that preserves both our heritage and music in a way that is both striking in beauty and light-hearted in fun,” Vennink comments. Vennink has experience with madrigal singing groups and dinners dating back to his college and graduate school years. He organized similar events at other churches that he has worked for in other areas of the country. Many of the performers also have choral or madrigal singing experience through The Music Makers, a singing group from the former Sacred Heart Parish in Southbridge. Vennink says that madrigal groups like the one depicted by the Medieval Feaste were “ambassadors of arts and culture and the news as they travelled from village to village” in the middle ages. The event is designed to be reverent and to spark a sense of connection to the past and to others. “This is not only living history but also live interaction with art in a society that continues to isolate itself with technology and alienates itself from authentic human interaction. Like the old song says, ‘people need people’ and we are trying to share a positive and timeless message of beauty, faith and humanity,” Vennick says. Proceeds from the event will go to fund a choir trip to the Vatican to sing for the pope. The group hopes to plan the trip in the next few years. “It has been a dream for many of our singers to be able to go to Rome and share our voices with the Holy Father. The trip is not a vacation, but a ministry and will include not only our parish singers, but any community musicians who would like to come along,” Vennick adds. Performances will be held Friday, Dec. 7, Saturday, Dec. 8 and Sunday, Dec. 9 at 6 p.m. each night. Performances are held on the upper level of La Salle Notre Dame, 444 Main Street in Southbridge. Tickets are $30 per person or a table of 8 for the price of 7 seats. For tickets to the Medieval Christmasse Feaste, email ChoirSJP2@gmail.com or call (508) 320-2583. You an also stop by the St. John Paul II Parish ministry center at 279 Hamilton Street to purchase tickets.